As mentioned in the introduction to Lee Mount Baptist Church, there have been three earlier histories of the Sunday School. So we begin our summary of the historical documents relating to the Sunday School with the brief history from the Diamond Jubilee Re-Union 1845–1905. Several families of Baptists from Heptonstall Slack and Birchcliffe Churches, Hebden Bridge, settled at Ovenden, and having no Spiritual home, began to hold Cottage Prayer Meetings in the village in 1844-5. In a Cottage, afterwards extended to two, at Shay Lane, Ovenden, they opened a Sunday School, November 30th, 1845. The following year, May, 1846, a Church was formed, the Rev. C. Butler, of Heptonstall Slack, ofﬁciating, which continued with varying changes until 1857, when it was dissolved. Better premises were secured for the School, in the Mechanics’ Hall, Nursery Lane, in 1854, but the stay here was short, for the Village School, Moorside, was occupied by them in 1856. From 1857 to 1866, the. School was unconnected with any church, the workers mostly being members of North Parade Church, Halifax. The lowest ebb in the School was reached in 1863. Non-success damped the spirits of the workers. But the work was clear to them, and cheered by a few friends and the officers of the Sunday School Union, and after special prayer to God for direction, they took courage. In the autumn of this year, they began with fresh energy and hope. A fund was opened and subscriptions were commenced, with a view to build a School-Chapel. North Parade Church, Halifax, this year (1866) recognised the School as a Branch. At Bank Top, 2,000 yards of land was purchased, on which to erect a New School-Chapel in 1869. This position was considered more suitable for building a New School and Place of Worship than in the village of Ovenden, where there were three other churches and schools. At Bank Top or Broad Tree as the district was called, there was neither Sunday School nor Place of Worship. On September 16th, 1871, the teachers, scholars and friends met in high glee and gladness, to take part in the ceremony of the Stone-laying. Malcolm Bowman, Esq. (instead of his brother, F. H. Bowman, Esq. ), laid the stone. The Revs. I. Preston, B. Wood, W. Gray, H.I. Senior, R. Hardy, T. Gill, J.A. Andrews, Messrs. Miles Birkbeck, H. Townsend and W. Oswin took part. Note. —An interesting incident happened at the Stone-laying. Mr. Bowman enclosed ‘a handsome subscription in an envelope addressed to the Secretary of the Baptist Chapel, “Lee Mount.”’ This name was considered so suitable and appropriate to the locality, that “Bank Top” had to give place, and the new name was at once adopted. 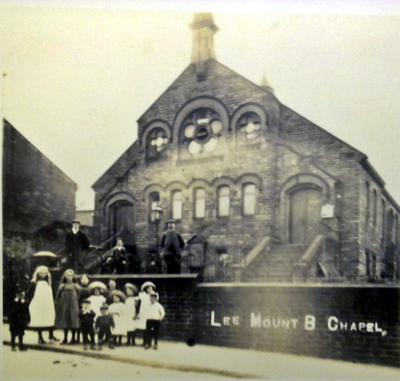 It thus came about that the Baptist Chapel was the first place to bear the name “Lee Mount,” which is now the name of a populace and respectable district. On Good Friday, 1872, the New School-Chapel was opened. Sermons were preached by the Rev. T. Goadby, B.A., of Derby. On Easter Sunday, sermons were preached by the Revs. I. Preston and B. Wood (Bradford). On Easter Monday, a Tea Meeting was held, at which 250 sat down. After tea, the Meeting was presided over by the Worshipful the Mayor of Halifax (J.D. Hutchinson, Esq.,) and addressed by the Revs. H.I. Senior (Providence); E. Springthorpe (Slack); T. Gill (West Vale); J. Taylor (Denholme); and W. Gray (Birchcliffe). The Rev. I. Preston reading the financial statement. On the following Sunday, the Rev. H.I. Senior and Mr. F.H. Bowman were the preachers. That the new sphere chosen for the development of the work of the Sunday School, and the extension of the principles for which Baptists stand, was the right one, has been abundantly proved. The 13 Teachers and 144 Scholars who took up their abode at Lee Mount in 1872 soon received large accessions. The cost of the New Buildings and Ground—£2,500—with current expenses, was a heavy drain upon limited resources, but with much self-denial, and the generous help of friends, the last of the debt was removed in October, 1889. Gradually, the 25 members connected with the cause when the Chapel was opened, increased year by year, and on April 15th, 1892, an independent Church was formed, the following taking part in the interesting event:— Revs. W. Gray (Birchcliffe); G. Needham (West Vale); A.B. Preston (Halifax); J. Lawton (Mytholmroyd); Carey Hood (North Parade); J. Taylor (Denholme); Messrs. J. Holt, S. Atkinson, J. Clay, E. Hirst, W. Gill, H. Townsend, W. Wilson and J.H. Hooson. This course was taken with the warmest approval of the Church at North Parade. The relations with this church had been of the most agreeable character from the year 1866. Number of members formed into a Church was 134. Teachers in the Sunday School 38; Scholars 416. 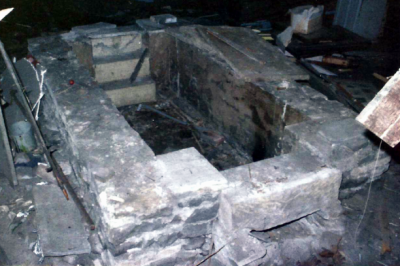 The School has ever been the nursery to the Church, 90 percent of the members coming from this source. The Church inaugurated a stated pastorate in 1893. The Rev. J.H. Robinson being the first minister, and was succeeded by the Rev. D.B. Davies, in 1899. Some years ago, a New Chapel Fund was commenced, and now stands at nearly £1,000. Towards this object, £500 has been promised from the 20th Century Fund, available when building operations begin. Also a small fund is being raised by the Sunday School for the purpose of furnishing Class-rooms to be provided in the New Chapel. In reviewing the past, there is much to thank God for, and’ much that affords an incentive to take courage for the future. Others have laboured, and we have entered into their labours. May the heritage that has come down to us at so much sacriﬁce and devotion, be an inducement to us to hand on, in God’s strength, to coming generations, a more glorious heritage. Two documents give an insight into what was involved in running a Sunday School and mark the final year of the Ovenden General Baptist Sunday School in Jeremiah Stead’s School and the first year of Lee Mount Baptist Sunday School. We have had an increase of 2 Teachers and 26 Scholars during the year our present numbers being 16 Teachers and 167 Scholars; yet, while we have increased our number and number of attendances, we have to regret a decrease in the rate for and of attendance of Scholars. We must not be satisfied with our average attendances of Staff. 91 percent in the morning and 41.73 percent in the afternoon. The average morning attendance had been 75 Scholars taught by nearly 8 Teachers. The afternoon average has been 78.71 Scholars with nearly the same number of Teachers as in the morning. There has been a greater regard paid by the Teachers to regular and punctual attendance than in former years. An earnest desire to discharge these responsible duties, as trainers of the young for Christ, has led them to count no labour to [sic] great if they to gain that end. The Missionary Society and Band of Hope are both in healthy condition. Owing to the increased support which the School had received we have been enabled to hand over to the Building Fund a very handsome sum. We have received £10 from the legacy left by John Cobbet Esq. for the Dissenting Schools in the Parish of Halifax. We are hoping to remove to our New Chapel in the first months where we shall have greatly improved accommodation and where our responsibilities will be inovated also. May our Heavenly Father who has thus far prospered the work of our hands fit us for our greater responsibilities and raise up others who shall help in the good work of rescuing the young for Himself. We have much to encourage us in our labours; yet we have many things to improve. May God grant us such grace that we shall not grow weary in well doing. The desire of the last 20 year has this year been realized. We have opened our new, beautiful, commodious and well adapted schoolroom and we are grateful to God & to all friends who have so liberally assisted us in the great work. What a change has come over us! We have now four classrooms which would nearly have accommodated our School last year, beside an ample School room in which we can conduct a school of 300. We no sooner commenced our labours in our new place than our scholars began to increase in number which caused the teachers already in harness to have more work and to draw upon the Senior Classes to meet the emergency. Owing to this, the school had not been as well under discipline as we should like to see it; still we trust when we have fairly adapted ourselves to the new state of things, and have received an increase of teachers, and the young teachers have become experienced we shall have a school that shall compare well with any in the locality. The number of Scholars on the books last year was 167 — teachers 16. The present number of Scholars is 323, — teachers 19, being an increase of 156 and 2 teachers. The average attendance in the morning has been Scholars 130.83, teachers 10½.Afternoon — Scholars 131.83, teachers 10½. The average attendance of Scholars too will appear low if we take our present number, being only 40.58 in the morning and nearly the same in the afternoon. But taking the average number (254) on the books for the year it is fair, being 51.18 in the morning, 57.57 in the afternoon. We are happy to report 18 scholars & 1 teacher who have joined the church during the year. One scholar — a young person — has been removed by death, but we have good hope that our loss is his eternal gain. The Missionary Society has to be re-organized though as much money has been raised as in former years. The Band of Hope is still dong its good work and increasing in number. The Young Men’s Association is carrying on its operations and a fair amount of interest is taken in it. The School Collections amounted to £22. We have closed a year which will long be remembered by us and we pray that we in the future as we the future may have the smile of our Heavenly Father upon us. 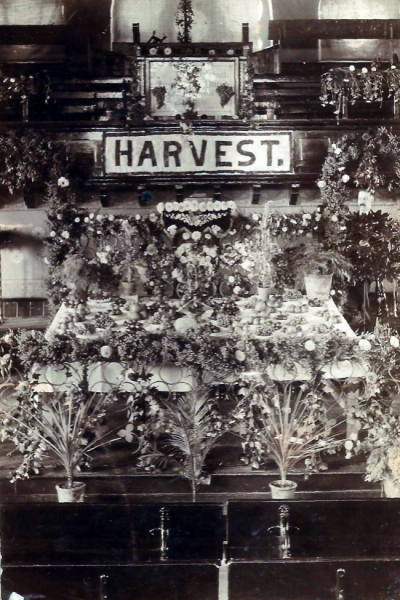 We have an undated photograph of a Harvest Festival held in the school chapel before the church was opened. Like all Sunday Schools in the nineteenth century, it participated in the annual Sunday School celebration every Whit-Tuesday in the Piece Hall. We have programmes for these events from 1880, 1885 and 1890 which show that the Sunday School had around 40 teachers and that the number of pupils rose from around 250 to over 400 in that decade. The Halifax Sunday School Union continued this tradition into the nineteen-thirties and we have programmes for these events in 1912, 1923, 1932 and 1933. The Sunday School had celebrated its own anniversary almost from the outset, using Providence Church until it had its own building. We have various programmes and handbills for later Sunday School Anniversaries along with the Sunday School Rules adopted in 1928. 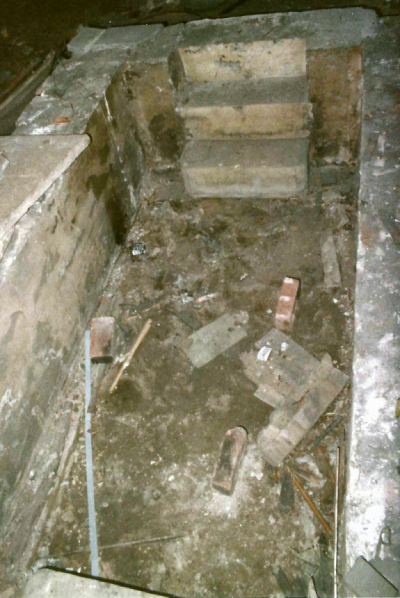 Finally we have two photographs of the baptistry in the old school chapel taken in December 1979 when the old school building was being demolished. Brief Baptist Church History written by Joyce Brook and Joyce Patterson in 1992 which was updated in 2012. As a General Baptist Church, the church, like many Methodist churches, took an Arminian rather than a Calvinist approach to the doctrine of predestination. You can read about the life of Arminius and some of the works of Arminius. Dan Taylor, a Halifax man, was a key figure in the development of the General Baptist Churches; this is Dan Taylor’s testimony. If you have any comments or questions, please use the Lee Mount Baptist Church contact page.